Our house and boat (En Passant, C320 #933) are in Pensacola, Florida. But I am trying to "ease into retirement' and still working (75% appointment, flexible schedule) in Houston, Texas. Thus, I became interested in software that would allow me to use (in Houston) the C-Map card in my RayMarine Chart plotter to develop routes and waypoints for sailing trips originating in Pensacola. A brief description of the program that I purchased, PC-PLANNER NT+, follows. The price, including a 128kb User C-CARD was $179.95. Price, without the 128kb User C-CARD is $149.95. What you receive. 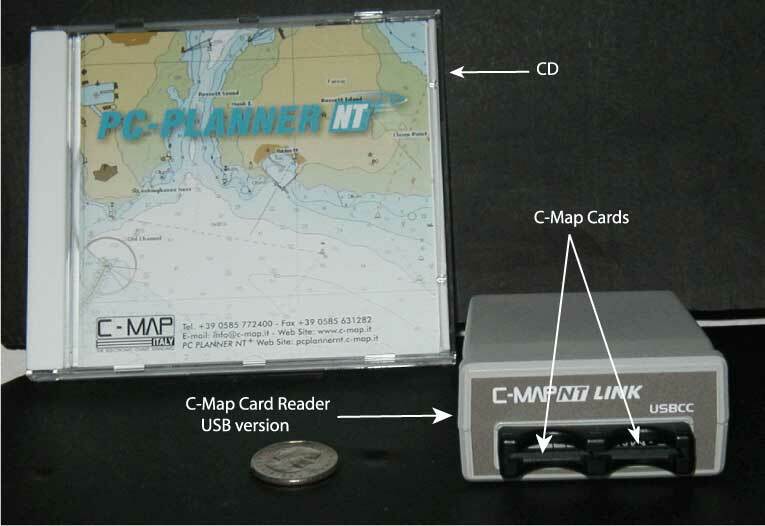 I received: 1) a C-MAP dual slot cartridge holder with a USB connector; 2) a CD with the User Manual and installation program; and 3) a 128kb User C-CARD that can be used to transfer waypoints or routes to some (see below) Chart plotters. C-CARD READER PPCCR-1/PPCCR-2 or USBCC Reader Available Parallel Port or USB port. print the page that is currently displayed by the program. The program is easy to use. The basic modes of the program are accessed by clicking on a small number of icons. File Manager mode allows User Points (waypoints), Routes, and Tracks to be copied from or to the PC Hard Disk, a floppy disk, a User C-Card, or PC-PLANNER NT+ memory. Print mode is used to print a copy of the chart that is currently being displayed. Data Receiving mode is used to read waypoint data from the PC serial port. Pan mode is used to move around in the charts. Move the cursor with the mouse and click to redraw the chart centered on the cursor position. Zoom mode is used to change the scale of the chart. Left click zooms in (more detailed chart); and right click zooms out. The chart is centered on the location of the cursor when the chart is redrawn at the new resolution. To use Info mode, select the Info icon and left click on the area of the chart where you want information about ports, tides, obstructions or other information stored on the C-Map card. A-B mode is used to find the distance and bearing between two points on the chart display. Two examples of the screen display are shown below. These are not high resolution images because I obtained them using the Prnt Scrn key to capture what was displayed on my monitor. High resolution pictures can be obtained by printing from within the PC-Planner NT+ program, but the Lat/Long and Distance/Bearing numbers at the bottom of the screen do not appear in the image. The first example is a picture of the screen in Pan mode. In this mode, wherever you move the cursor, the latitude and longitude of the corresponding location on the chart is displayed at the bottom of the screen. Also, in this mode if you move the cursor over a navigational aid, a small window appears in which the marker number, and light and sound characteristics are shown. To make the second picture, I zoomed out (note 99 NM scale) and used the A-B function to estimate the distance between the Destin pass and the pass at Panama City. The distance is 41.89 NM and the bearing is 111 deg True, as noted on the bottom left. cursor at the desired location on the chart and left-click. The waypoint is stored in program memory and displayed on the chart. You can select a number of different symbols to be associated with the waypoint (anchorage, fishing spot, etc.) To delete a waypoint, click on the Del User point icon, move the cursor to the point to be deleted and left-click. To move the waypoint, click on the Move User Point icon, left click while dragging the waypoint to the new position, then release the left button. Routes are created by clicking on the Create new route icon and then left clicking on the series of chart positions you want to use to define the route. The waypoints making up the route are displayed on the chart and a line connecting the waypoints delineates the route. An example is shown in the next picture. The next picture illustrates Route information as stored and displayed by PC PLANNER NT+. The description can be edited. The cumulative distance (column 8) is a nice feature. Also, if you enter a hypothetical speed, the time taken to traverse the leg and cumulative time for all legs are given in columns 10 and 11. What the program does NOT do and other things to note. First, PC-PLANNER NT+ runs only if a C-CARD reader is connected to your PC. Even if you have already installed the program and have the program CD in the CD drive, the program will not run unless the C-MAP card reader is plugged into a USB slot. The program will run if the card reader is plugged in even if a C-MAP card is not present. In this case, a low resolution world-wide chart stored in memory can be used to illustrate the program functions. Second, PC-PLANNER NT+ is NOT designed to serve as a navigation station when aboard your boat. There is no provision for interfacing the program with radar, depth, speed, wind, or active GPS signals. Third, remember that the bearings are given as True, not magnetic. Compatibility. I have only been using the program a couple of months and do not pretend to be an expert user. It is my understanding that for RayMarine Chart Plotters, C-MAP writable cartridge support is limited to the new Pathfinder PLUS series with the new HSB2 system. After creating waypoint lists and routes in PC-PLANNER NT+, I can download them from my laptop to my Garmin handheld GPS 12 and write them to a C-MAP writable cartridge. But since my chart plotter is not one of the PLUS series, I cannot read the waypoints or routes into the chart plotter directly from the User C-Card. I knew this would be the case; I purchased the User C-Card to download waypoints to the chart plotter on the boat we charter in Maine each summer. Assuming you have a suitable PC interface cable for your GPS/Chart Plotter, the manual states that PC-PLANNER NT+ will accept any compatible waypoint data from the PC serial port. I have not used this function. According to the manual, the data must be in NMEA0183 format using the RTE and WPL messages and only one route can be received at a time. I have used the transmit function to transfer the list of waypoints I developed using PC-PLANNER NT+ to my hand-held Garmin GPS 12. The only problem I encountered was with the rules for waypoint names. By default, waypoint #60 would be given the name UP 060 (user point 060) by PC-PLANNER NT+. This was not acceptable by my Garmin GPS 12 until I renamed the waypoint, eliminating the UP prefix. How I have used PC PLANNER NT+. I used the program to plan our sailing trip from Pensacola to Appalachicola last month. I took my C-map NT+ card (NA-C420, Gulf of Mexico) and a cruising guide to the western coast of Florida to Houston. Although I’ve done some sailing along the Gulf Coast, it was 14 years ago and I’ve never explored the area between Destin and Carabelle. So, I read the cruising guide while looking at the appropriate charts to identify anchorages, marinas, noting sandbars to avoid, etc. Also, as an aid to planning, I used the A-B function to measure distances from pass-to-pass. Of course, all of this could have done with paper charts. However, using PC-PLANNER NT+ was a big time-saver in developing waypoint list and routes to areas that I knew we would want to explore. I printed the page showing each of the routes that I created (see example). These were laminated and holes were punched for storing in a binder. When we were using the printout of one of the routes in the cockpit, I removed it from a binder and put a spare companionway lock through one of the holes to prevent it from blowing overboard. I’m still unaccustomed to the open stern, so I need to come up with another strategy for keeping things aboard. Also, I saved the waypoint data concerning the routes on the disk of my PC, read the data into Excel, and created a table (see example) that can be sent as an e-mail attachment so others can enter waypoints into their personal GPS or to study the (paper) chart to see details of planned routes or anchorages. I also found the Tide information useful. I had been warned that storms had rearranged many features of the passes from the Gulf and, in particular, that the height of the bridge at the Destin Pass was less than the 50 ft. shown on the chart. Referring to the Tide information for April 12, 2003 (the C-card has tide predictions for the years between 1996 and 2020), I noted that the tidal range for that day was predicted to be only 0.54 ft - a little more than 6 inches! So, we had reason for concern with a mast height of 47’7", not counting antenna, and we would not gain much by going through at low tide. We did make it under the bridge. The marker at the center span showed 48’9" when we arrived at slack tide. We waited until no traffic was coming from either direction and inched our way to the edge of the bridge and was relieved to see the antenna bend slightly instead of the mast touching. Summary. PC-PLANNER NT+ does not have all the features that are found in more expensive navigation software packages. These packages allow a PC to interface with navigation and other instruments and to serve as another display in a navigation system. However, I find it to be very useful for planning trips to new areas and creating routes and waypoint lists for areas that I sail regularly. Update (Jan. 2006). Since this report was prepared in 2003, I have used PC-PLANNER NT+ to generate more than 400 waypoints for the areas we sail in Maine, waypoints for the areas I sail along the Gulf of Mexico (thus far, from the Chandeleur Islands to Apalachicola, Florida), and for a charter in French Polynesia. I have never found a serious discrepancy between the waypoints generated and actual coordinates when I arrived at the location plotted. To see trip reports of the locations sailed, click here.